A shelf in my study holds a collection of debris from process mistakes. None of the errors were mine, by the way. One memento is the recovered tip of a furnace (roaster) thermowell. It was seven years old when it corroded through and caused an unnecessary shutdown that lasted nearly a week. No records were kept. Nobody scheduled it for replacement. The plant engineer was left to wonder why the roaster tripped on over-temperature and how to deal with molten, soggy iron oxide collected in the cone. Poor documentation led to poor troubleshooting and a loss of production. This is what is called a run-to-failure (RTF) mistake. If your plant is on a shoestring budget and RTF is all you can afford, how can you make the best of it? First, develop an inventory of equipment (pipe, vessels, rotating equipment, etc.) and instruments. Then, compile published values (from textbooks, industry standards, etc.) on expected operating life of new equipment. Here’re a few you can use: 1) process piping — 15 years or 10 years or less in corrosive service; 2) non-corrosive utility pipe — 20 years; 3) major equipment — 20 years or 5–10 years in corrosive service; 4) instruments — 10 years or 5 years or less in corrosive service; 5) heat exchangers — 20 years or 10 years or less before tubes or plates begin to fail in corrosive service; 6) fired heaters — 10 years but tubes 1–2 years; 7) furnace brick — 10 years or 1–2 years in corrosive service. Serviced equipment requires inspection to estimate remaining life. Now, you’ve got a blueprint for RTF. If you don’t know how long something has been in service and it’s critical, replace it. If you do know, schedule a replacement at the end of its textbook life; if an inspection then shows substantial life remains, update your estimate. Use common sense and avoid false economies — changing a $150 thermowell can preclude far greater costs if it fails unexpectedly. Make a note of items that you’re not sure of; identify the symptoms when they do fail and create a spreadsheet defining these outcomes. Next, develop the inspection techniques you’ll need to improve the reliability of your service life estimates. With carbon steel, ultrasound can detect a thinning wall. With stainless steel, check the welds for pitting and rusting. With duplex and other complex alloys, you must resort to destructive tests, e.g., electron-microscope acid dye tests, to reveal penetration of corrosives. With fiberglass, plastic and glass pipe, look for discoloration and embrittlement; again, you will want to sacrifice sections of pipe for analysis. Once you’ve established a reasonable service life for your equipment, RTF won’t be so full of surprises. To be safe, generate a troubleshooting guide to help superintendents and operators know when something fails unexpectedly. 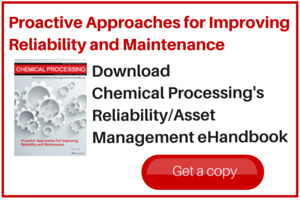 Identify in your operating procedures the failure modes. For instance, if a thermocouple fails, it fails high. Before new equipment and processes are put into service, ensure thorough quality control: 1) check mill test reports for metal fabrication, mechanical tests and other data for polymers, glass and specialty items; 2) perform non-destructive tests, e.g., x-rays, for welds; 3) adequately oversee welder qualification and construction; and 4) compile complete documentation. Surprisingly, the first three are relatively easy: all you need is a reliable contractor. The last is much more difficult and requires discipline. Far too frequently I’ve heard company managers say they didn’t have time to develop isometrics or even piping and instrumentation drawings (P&IDs). The U.S. Occupational Safety and Health Administration issues fines for inaccurate or missing drawings! Isometric drawings are the best format for defining corrosion problems with pipe because they should show weld locations and other mechanical details. P&IDs often are too crowded with instrument and control minutiae, so mechanical details such as whether a valve is flanged or socket-welded are left to pipe specifications. The construction company building a new process will produce all the documentation you need. In fact, the firm will generate isometrics, whether you use them or not, for the new pipe. All you must do is keep the drawings current. When I was a young engineer, I was expected to perform a plant walk-down and then correct all the P&IDs and isometrics in my spare time. This was part of my education. If you’re a young engineer, it should be part of yours.